A latest research revealed that 60% of sleep apnea sufferers leave CPAP due to its many side effects. Among many, common side effects are intolerance against mask, claustrophobia, runny nose, ear problem, bloated stomach, skin problems, dry eyes, increased daytime dizziness, dry mouth, inability to sleep and many others. The No. 1 problem is the choice of incorrect mask size. 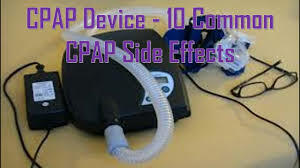 The people who are unable to bear CPAP mask in the first month are found never able to bear it in the following months. Particularly, people who have beard and mustaches find it really hard to cope with CPAP. The lousy mask often seeps out and causes infection, dryness in eyes or causes irritation to the partner and the patient. This is really a hard nut to crack for most of the people. Sensations of claustrophobia are most of the time intolerable for the people. A large number of people are never able to adjust with a mask and never return back to attempt another time, once they leave mask in their first month. Many people are unable to bear with air pressure. Though, people can use the ramping feature to overcome this difficulty. Ramping feature progressively raises air pressure but researchers have not provided any evidence that ramping feature enhances CPAP conformity. Many people complain about dried up blocked nose that follows up with sinus infection or sinus pain, while several other undergo severe dizziness or scratchy feelings inside the ears. Difficulty in breathing is also a common expression of unhappiness. There are people who are unable to bear with nasal pillows but probably bear with facial mask. While others may tolerate nasal pillows or nasal masks. Mask leakages develops skin outbursts, ulcers, acne and sores etc. Another extremely disturbing situation is dry eyes. Several people describe symptoms of tearful eyes because of mask leakage. Skin related issues differ from patient to patient and start from simple streaks to wounds, blackheads, white heads or occurrences of acne on nose or facial area. There are several people, who complain about their inability to sleep with CPAP devices. Certainly if you are unable to sleep, you will stop using it. Patients also complain about the dryness of mouth as another one of their difficulty with these pressure devices. They further describe unhappiness of tongue burning, tongue gumming to the mouth's roof, inflamed tongue, extreme mucus and lots of other allied issues. An extremely frequent protest is the removal of mask while sleeping. This is possibly due to lousy mask fitting. However, great many of the sufferers are never able to discover a remedy of this issue. Another similar issue is to getting up for urination and not remembering to turning on the device or totally abandoning to fall asleep again. Not to mention, large number of people get up during night for urination. Many people and their families are not happy with the noise of CPAP device or hissing sounds coming out of the leaks. There are several other issues that people do not describe regularly. However, there are people who mention buzzing or ringing sounds in their ears that are continuous and do not fade away. Extreme daytime dizziness and nightmares associated with CPAP are some other undescribed side effects. Sinus, respiratory, pneumonia and acute bronchitis are the side effects that spring up due to improper hygiene of the apparatus. One frequent unpleasantness described is the feeling of exhaustion throughout the daytime and not feeling enlivened.